I am having a fair few people asking how we went with Cyclone Nathan - asking if there was a newsletter about it. Well, I was not rushing it while there was so much exaggeration reported by news channels. The damage was not big in town, it was nowhere close to what Cyclone Ita did last year. But it's time for a newsletter anyway, another news being that there is no Wet Season, not at least in Cooktown! To Australians I don't need to mention what a weird year it has been, with a very quiet season until late February, then double, even triple cyclones - first Lam and Marcia, now Nathan, Olwyn and Pam. 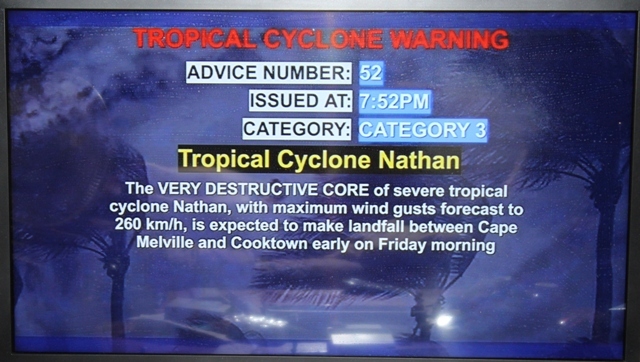 But the weirdest of all - cyclone Nathan, was around for a good couple of weeks, visited our coast first, then went out to the sea, only to return to the Cooktown area on a second round (and later as we know to Northern Territory to the areas affected by Lam only a month before). And still, during the whole time that it was on the Coral Sea, we really did not think that it would return to Cooktown. With 50 years of no cyclones and then Ita last year, it was too unreal a thought that we'd have severe cyclones two years in a row in the same town. But by the beginning of last week we were looking at BOM maps in disbelief, and sometime mid-week the reality started to sink in. And here we were sitting last Friday, once again with windows taped and generators ready for work-out. On Wednesday the Cat 4 was predicted to come straight to Cooktown, and that was when we did our preparation. On Thursday the prediction changed to further north to Cape Flattery, calming most Cooktowners down enough to stay at home instead of going to the cyclone shelter again. We, too, stayed at home, and - were awake the whole night. Even if we had wanted, the noise would not have made it easy to fall asleep. It was around midnight as Nathan started getting really close to the coast, and some time between 1am and 3am were the worst hours. It was blowing from the same side as it was during Ita - from the north-east - straight into my office wall, and in between most gusts, every now and again there was a stronger one, that was loud enough that I jumped up, watching if the window holds. But it helped that Nathan headed north, and not right at us as first predicted. It was a lot calmer than Ita, we did not hear trees snapping or any other damage. Until - there was a loud bang - right on the wall outside. We stick our heads out the toilet window - only to see it's the neighbour's garden shed - completely demolished - flown to us and now banging into our wall. Most neighbours were up, there were lights everywhere, and we were just wondering for how much longer were we going to have the power. Luckily that was towards 3am and the winds started to calm, Nathan was just about to cross the coast north of Cape Flattery, but was by now getting away from our Cooktown area. As the winds died off the rain picked up, and we finally felt we could have a couple of hours' sleep. 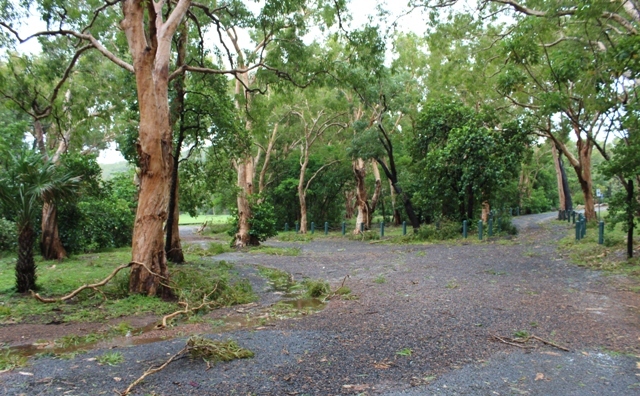 Cooktown Botanical Gardens the morning after - only small branch damage. Once the daylight arrived and it was ok to go out to the town, we went checking the damage. And the good thing was - there was none. Almost, anyway. A tree down in the riverfront park, but not lots of them like after Ita. Branches on the ground, small ones, and not much. Surely a bit more in back yards, but still, nothing compared to Ita. Once again we had had a very good luck. Obviously if Wednesday's prediction held and we had a Cat 4 coming right to the town, things would have been very different. Instead, Cape Flattery copped it, and it was also the place where Cyclone Ita first crossed the land last year, before downgrading and coming to Cooktown. Luckily so little inhabited, but after two direct hits from Cat Fours last and this year, it will be a very broken place, for a long time, along with Lizard Island. We do intend to go and have a look, but from experience with Ita and the time it takes before everything opens up again, we will not be able to get in there for a good couple of months, it will take time to even clean the track from fallen trees. As for the rest of the Wet Season I can say that in Cooktown it has been hopeless. Ok, we had rains during every passing cyclone. Both Lam and Marcia formed on the Coral Sea outside Cooktown, and Lam brought us a fair bit of rain when it first crossed the peninsula, still as a Tropical Low. But the rest of the days during this season have been mostly clear and sunny. Archer River crossing as it has been much of the Wet this year. Photo courtesy Brett Jenkins - thank you! 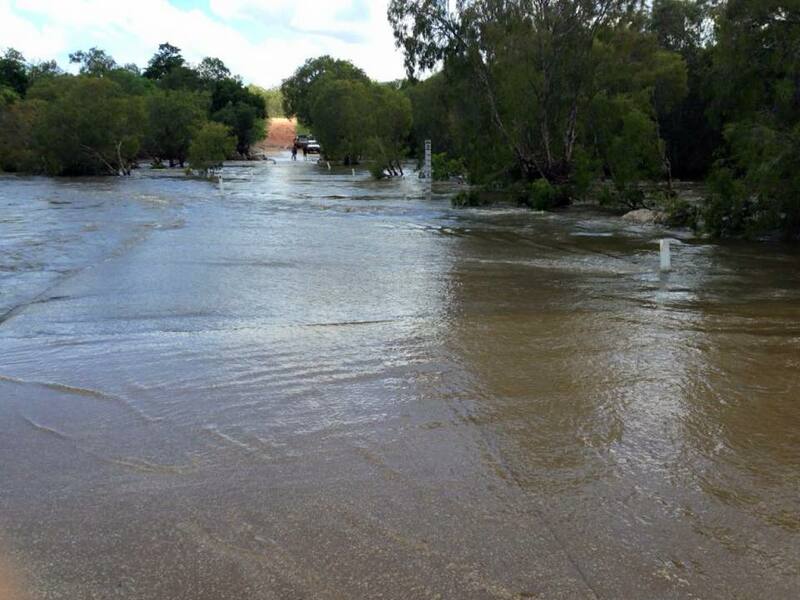 Further up the Cape, however, Archer River has been cutting off Weipa and the rest of the peninsula for months now, so the conditions have obviously been a lot wetter. I will update this, and the roads, as we are getting closer to the travelling season. And finally - this time next month the website will be mobile friendly, meaning even if you don't bring your laptop to your trip, you can easily read the site on your mobile phone (before that happens the text is too small on mobile screens).